Update: March 18, 2019. Since our visit, ZOOm Air is now called CFZ Seminole Aerial Adventures, but it looks to still be run under the ZOOm Air umbrella. We’re an outdoorsy kind of family, and I’d like to think we’re up for most adventures… that can accommodate young kids. 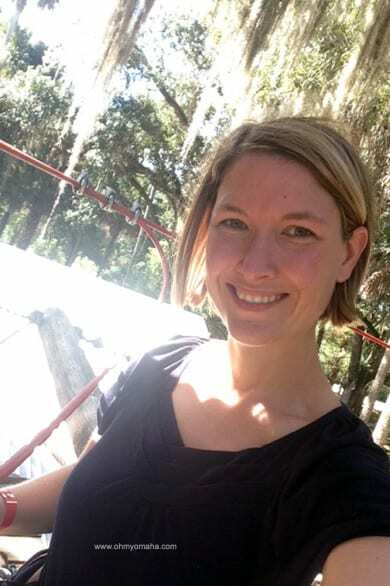 The idea of trying out a ropes course with zip lines was one of the first things that caught my attention when researching family-friendly things to do on our upcoming trip to Seminole County, Florida. And I found one that was suitable for even my youngest child! 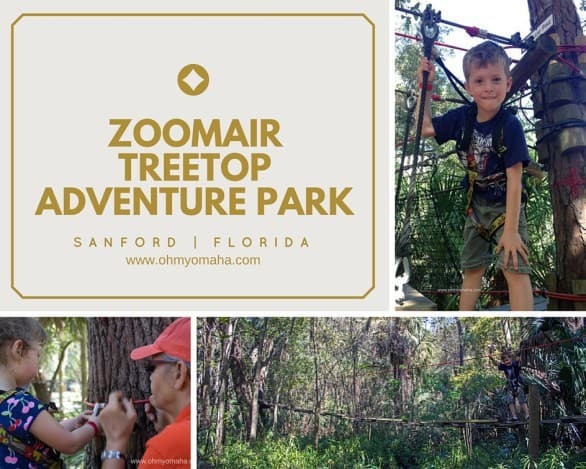 ZOOmAirTreetop Adventure Park has two locations in Florida – one in Daytona and one in Sanford, just outside the Central Florida Zoo. 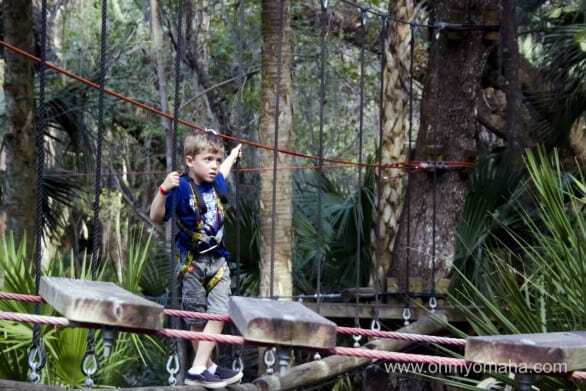 I’ve never found a zip line outfitter that offered courses suitable for children young as 4 until ZOOMAIR. I was so excited for us to try it out. It was one of the highlights of our whole trip, and I recommend giving it a shot if you’re not afraid of heights. Me and Farley after we conquered our zip line courses at ZOOMAIR. Children who are 5 and older (between 36 inches and 60 inches tall) can do the children’s course. They are fitted into harnesses and provided instructions on clipping themselves on to the safety ropes. Maggie was the patient instructor for the kids’ course at ZOOmAir. The kids Upland Course is never gets higher than 4 feet above the ground ground, but does provide a challenge and a thrill of adventure. Farley likened the experience to being on “American Ninja.” It ends like the adults’ course, with a zip line (but much lower to the ground). A guide walks with kids on the Kids Upland Course, while a parent stays on the ground. 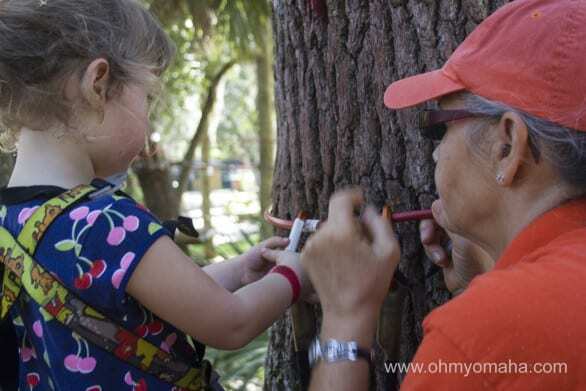 Safety is a priority and even a 5-year-old can understand having one clip on a rope at all times. The kids’ guide, Maggie, was very patient. It was a challenge for our younger daughter and while she struggled to get through each obstacle, our nearly 6-year-old cruised along. She’s an agile girl, and was determined to keep up with her big brother – and she did. The end of the first course includes a zip line. Farley got to do the zip line several times while Mooch finished the course. Farley loved each new challenge along the course. All three of us got a kick out of the adventure the courses presented to us. 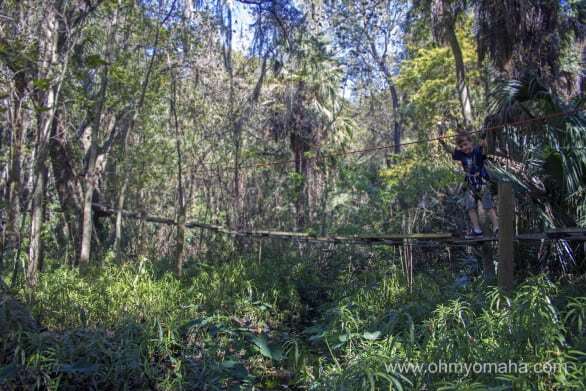 Older kids have the option of continuing on to the Kids Jungle, which is a little higher above ground and more challenging. The guide stays on the ground with the parent along the course. I stayed with Farley so he could continue on while Mooch and Mr. Wonderful went to the zoo. 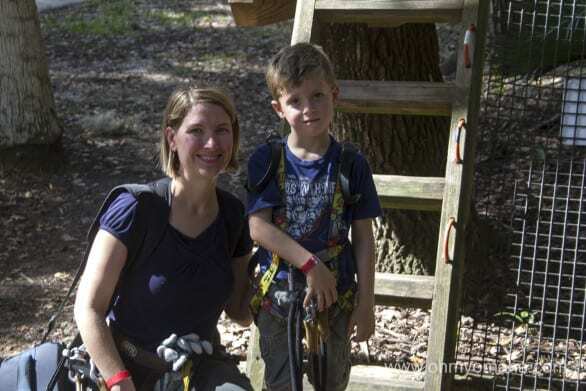 It gets a little more challenging if a kid opts to go on to the second ropes course, the Kids Jungle. When they complete their course, they’re rewarded with a little candy and a bumper sticker. Note: Adults, for some reason, do not get candy after completing their course. Hmph. 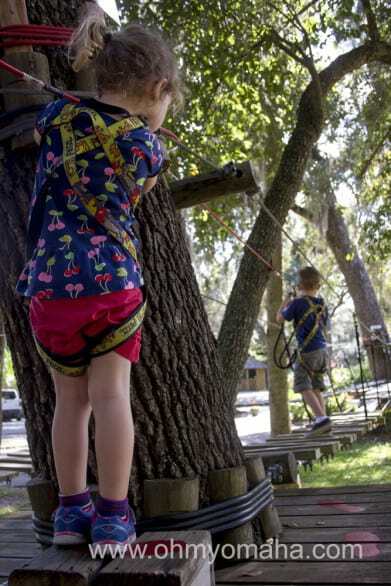 Before you begin your course, you’re fitted into a harness and walked through a practice course so you can get the hang of clipping yourself on to the safety ropes and how to do a zip line without injuring yourself. You’re also advised that you get three warnings and if you break a rule (horse around, forget to clip yourself in, etc. ), then you’re kicked off the course. You also are warned that if you get stuck and have to be helped out of a bind, you’re done for the day. Since it was just me on the course, I was a dutiful rule follower. The dutiful rule follower. Except for this stealth selfie. I did the Upland Course, which took about 45 minutes to complete (they recommend estimating an hour and a half, especially if there are more people on the course). You do need some coordination and balance walking along, but it’s still something any beginner could do. It was very physical, which was welcoming since I fully intended to eat way too much at lunch. Most of the course is a series of ropes obstacles and a bit of climbing. If you’re afraid of heights, it’s not for you. The end of the first course is a fast zip line back to ground, where you can either continue to the more challenging Rainforest Course (if you purchased that option), or you return your gear and go on with your day. The Rainforest Course has more zip lines. Here’s where you’ll get fitted into your harness, sign a bunch of papers and get started on your safety training. – We arrived just about an hour after the location opened (opens at 9 a.m.) and we were able to get started right away. No one else was on the course with us at that time and it was awesome. I’m told during the busy season (around Thanksgiving to Christmas especially), you can expect a longer waits to get started and to progress through the course if you’re not there first thing in the morning. – You need to buy your ZOOmAir passes at the ticket booth for the zoo. Walk past the ticket booth and follow the signs to the Harness House. – You’ll fill out waivers for everyone and hand over ID. If you want your ID back, you need to remember to return your harness and gloves. – Wear comfortable, close-toed shoes. Athletic shoes are a smart idea. Farley had slip-on shoes and he had to double up socks to be sure they wouldn’t fall off. 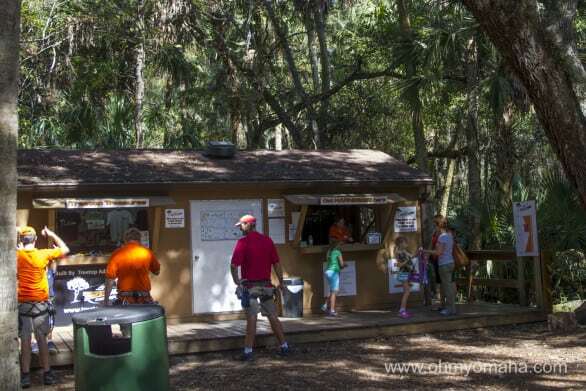 – This is located just outside the Central Florida Zoo, sharing the same parking lot and ticket booth. 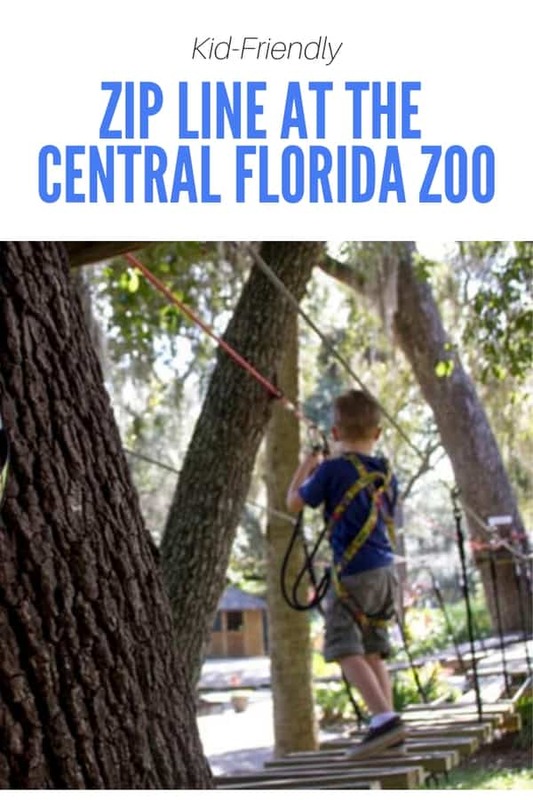 If you’re going here with kids, might as well make a day of it and visit the zoo. Hours: Open every day, except Thanksgiving and Christmas Day, at 9 a.m. Last admission for Upland & Rainforest combo admissions at Zoom Air Orlando is between 2:30 and 3 p.m.
Disclaimer: Our visit was hosted by Seminole County. All thoughts and experiences are my own.